Located just steps from the best part of Kailua Beach. The beach is a three minute walk through Kailua Beach Park where the waves are the most gentle, the sand is wide, and there are plenty of trees for shade, so you and the kids can play and relax at the beach all day. This home was thoughtfully designed to meet the needs of families. It has a large great room where all can congregate for meals, plan the day, wind down after a full day of activities or just relax. A delicious breeze will soothe your soul as you open the large glass sliders, revealing lush gardens and the pool. The two master suites are at opposite ends of the home and on separate floors, so that two families can enjoy each other's company, yet still have their own private retreat. The bathrooms are finished with hand cut stone, oil rubbed bronze fixtures, and frameless glass shower doors in a style reminiscent of a natural Hawaiian spa. The home sits behind a private gate and has a monitored security system. 7 night Minimum Stay. Longer minimum stays may apply to peak periods. View across the road of Kailua Beach and Park. All 4 bedrooms have A/C. Ceiling fans are also in every room. Dining table in great room. In each bedroom. Large flat screen in Great Room. Poolside covered patio with ceiling fans and table for 8. We hope to return to Paradise! Beautiful home, excellent security, close to a great beach. First of all, we have rented many homes and condos throughout the years. This is the best stocked home that we have ever rented. The kitchen has all the pots, pans dishes that you will ever need, whether you decide to eat in or go out. The owner even provides containers for leftovers to be stored (first time we have seen this). We were also provided with plenty of garbage bags, dish soap (even for the dishwasher) and laundry detergent. The kitchen also had different sized tumblers for after dinner drinks. This may seem like no big deal for most people, but I have stayed at many high-end places where they were not provided. The home was exceptionally clean and very close to the beach. In fact, we were across the street from a beautiful park by Kailua Beach. The security gate was an added bonus and very easy to use even though we never felt unsafe in this area (we walked to Buzz's Restaurant for dinner). The garage with opener was also an added bonus, nice place to store all of our diving gear. Very nice Tommy Bahama beach chairs with back-pack straps were provided. This home felt as comfortable as our own home, it was definitely nice to be away from the crowds at Waikiki Beach (we did do a beach day there). Kellie, the manager for the owners, had great communication and answered all of our questions promptly. 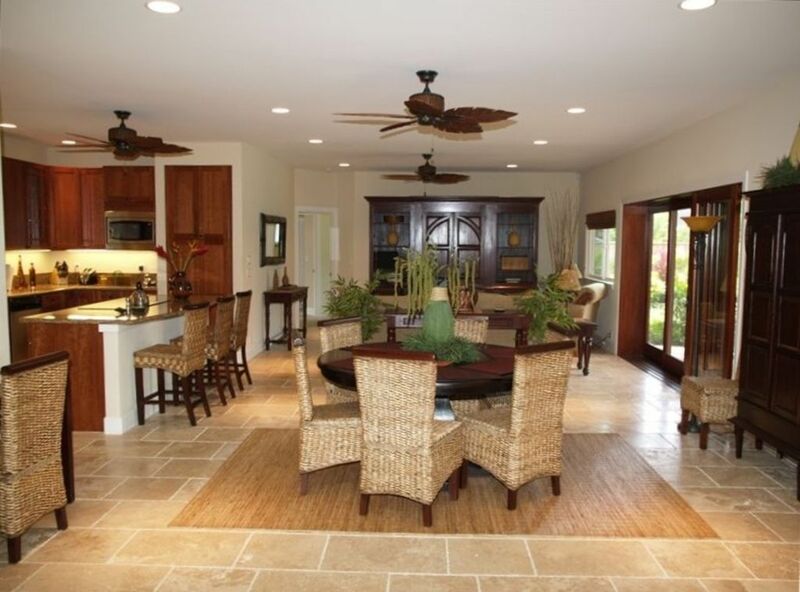 When visiting Oahu, we will surely stay here again and we would recommend this home to our family and friends. This house is just plain wonderful. Modern appliances, granite countertops, two master bedrooms with walk-in closets, two-car garage, washer and dryer, and FOUR full bathrooms. If you're coming from the Mainland you might be thinking, "What's the big deal?" But after having spent a few weeks looking at real estate in Kailua and Kaneohe, I can tell you, this house is a gem, with features that are extremely uncommon here. It is pure luxury, right across the street from one of the most beautiful beaches in the world. It also has a beautiful pool with lush, tropical landscaping; it really is paradise. My family of six moved to Hawaii and stayed for two months while we were waiting to move into permanent housing, and we loved every minute of it and hated to leave. Kellie the property manager was fantastic to deal with, and Liz the owner, was so flexible and accommodating to our changing schedule; I can't thank her enough. The house is perfect for a beach vacation. Beach towels are provided, and the garage has plenty of beach chairs, toys, snorkels, and boogie boards. I even left a skim board behind for future guests. This was a great stay and I highly recommend. This house was amazing, had everything you could want. Beautiful yard/pool. The beach access was especially great for a family, being able to walk there made beach days very easy. Will definitely be back. Our family of 8 (three generations) had a wonderful time at this beautiful house. The house is in the best location, right across the street from Kailua beach and park and a short walk away from stunning Lanikai beach (we enjoyed snorkeling there). Wonderful views from Pillbox Hike, just up the hill from Lanikai beach. We were able to explore some other parts of the island during our stay with our rental cars (North Shore, Hawaii Kai, Waikiki) and were happy to have chosen to stay in Kailua. The house was beautiful and provided lots of space and privacy for all of us. It was clean, well taken care of and stocked with everything we needed. The kitchen especially was probably the best stocked kitchen we have ever seen in a rental house. We enjoyed the outdoor pool as well as the grill. The yard felt very much like a private paradise. Kellie, the manager, was wonderful. She communicated with us before the trip and was very responsive to our questions during our stay. We hope to return to this beautiful place! The location of this house is fantastic. Walk across the road to the park and 3minuites later you are on Kailua Beach. The pool was nice as well. It is a little crowded out in the pool area and the living room when all 8 of us were in the same spot and there were not enough places for all 8 to sit comfortably at the pool or living room watching the Olympics. Kitchen was great. The house is all of 5 minutes from downtown and centrally located to all of the island and attractions. We had a great time. Special thanks to Kellie who was always available and helpful. 20-30 Minutes from Honolulu, But Feels a World Away! Yoga, Body Surfing, Boogie Boarding, Kite-Sailing.